If you have long been captivated by the skies, then you are not alone! Amelia Earhart knew within the first few hundred feet of her very first flight that she was born to soar. So, whether you're awaiting your pilot's license, or you simply want to pay homage to a fearless female leader this Halloween, this Women's Amelia Earhart Costume will give you wings. Everyone loves the story of Amelia Earhart's bravery and brilliance—she even sipped hot cocoa while completing the first solo flight across the Pacific!—and you will be revered wherever you go in this look. You may even earn a ticker tape parade! So embrace your love of high altitudes, navigation, and the thrill of flight and rock your costume look all at the same time. 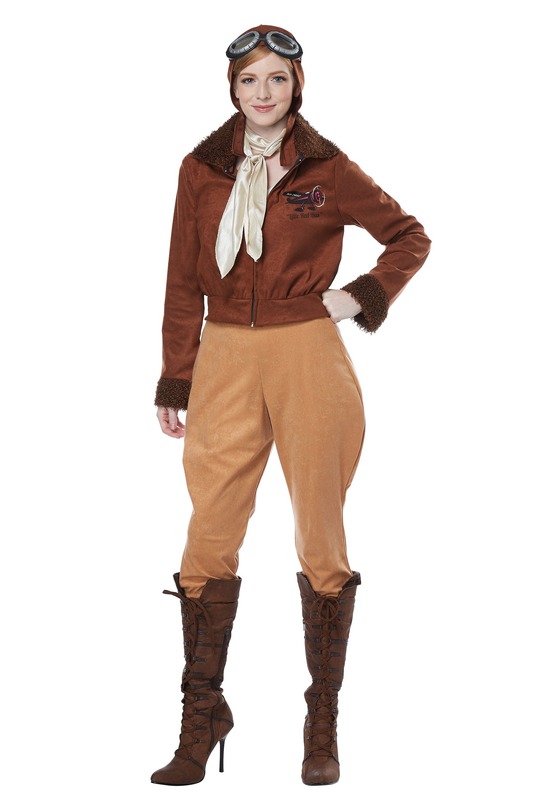 This costume transforms you from modern day aviation enthusiast to a 1930s aviation queen! It features a brown bomber jacket (you can't fly without one!) and tan pants cut to the style of the era, as well as the necessary accessories you need to get you ready for take off. You'll be flying high and in love with the freedom of the sky in this look. While Earhart famously said that, “Anticipation...sometimes exceeds realization,” this costume is about to blow that theory right out of the water. This look will exceed your wildest expectations (just like Earhart). Once it arrives at your door, slip it on and start planning your next great adventure. Be bold. Be brave. Be the first to do something awesome. Amelia would want it that way!